Originally discovered as a bacterial adaptive defense system, CRISPR-Cas9 uses antisense RNA remnants from past viral invasions combined with RNA-guided DNA cleavage to combat viral attack.1 The power of this system for targeted genome editing was quickly recognized. It has been widely adopted in many fields of cell biology research to generate targeted loss-offunction, gain-of-function, alternately regulated or protein-tagged gene mutations, whose function can then be studied in vitro or in model organisms.2 It also has therapeutic potential to correct disease-causing mutations, particularly when coupled with regenerative medicine using pluripotent stem cells. This system provides precisely targeted genome editing with high efficiency and relatively low cost, and has been heralded as a major technological advance toward clinical gene therapy. The CRISPR-Cas9 system consists of RNA and protein components, which together form a ribonucleoprotein (RNP) complex (Figure 1). The wildtype Cas9 protein has DNA endonuclease activity, and makes double-strand cuts upstream to a protospacer adjacent motif (PAM) sequence in the target genome. S. pyogenes Cas9 recognizes the 3-nucleotide PAM site, NGG (where N is any nucleotide, followed by two guanines [G]), and cleaves between the third and fourth nucleotides 5’ to the PAM site. The RNA component is required for specific target recognition, binding to an approximately 20 base pair complementary sequence in the genomic DNA. Full guide RNA activity comes from a duplex of two RNA molecules: a CRISPR RNA (crRNA) molecule, which is complementary to the target, and a transactivating CRISPR RNA (tracrRNA) molecule. The crRNA and tracrRNA molecules form a duplex via a short homologous region. Association of the crRNA:trRNA duplex with Cas9 causes a conformational change in the nuclease, allowing it to bind DNA at the nearby PAM site and implement the double-strand cut. Thus both complementarity to the crRNA and an adjacent PAM site are required for targeting Cas9-mediated cleaveage. CRISPR-Cas9 genome editing has been widely adopted by the research community, and application of the technology has progressed rapidly. Previous CRISPR-Cas9 systems involved transfection or transduction of multiple engineered plasmid or viral vectors encoding the crRNA:tracrRNA and Cas9 components. The vectors often integrated permanently into the genome, whereupon their expression allowed the RNP to assemble inside the cell. These systems were prone to insertional mutagenesis, prolonged CRISPRCas9 activity, and off-target mutational events. Advances in recombinant protein and synthetic RNA production have made it possible to directly utilize the crRNA and tracrRNA molecules and the Cas9 protein. These can be formed into an RNP in vitro and then transfected directly into the cell. This RNP system is faster and easier to use, and results in less off-target events compared to plasmid or viral systems due to the transient nature of the editing molecules. A variety of editing approaches can be employed to achieve different types of mutational outcomes. Loss-of-function or “knockout” mutations require complete destruction of gene function, which can be obtained from a variety of possible insertional or deletional events at the start of the coding sequence. Conversely, corrective point mutations require extremely precise changes. Knock-in mutations, often employed to mark genomic loci and/or track expression patterns, require the addition of exogenous DNA. In this section we summarize the different editing techniques used and how their results vary. Knockout mutations are typically generated by a process known as non-homologous end joining (NHEJ). In this method, CRISPR-Cas9 is used to create a targeted a double-strand DNA break in the gene of interest. The cell will repair the blunt-end break, using intrinsic DNA repair processes. The repair processes are error-prone, and often lead to the formation of small insertions or deletions (INDELs) that can result in truncated proteins. Alternatively, one might use CRISPR-Cas9 to generate double-strand breaks at two sites within the gene, thereby creating a large deletion spanning the two targets. Targeting the first or second coding exon will help to ensure complete loss of function. NHEJ specificity can be increased through the use of Nickase Cas9. In this form of the protein, one active domain has been deactivated (via D10A mutation), resulting in only single-strand endonuclease activity.3 Nickase Cas9 cuts only the DNA strand that is complementary to the guide RNA. In order to affect a doublestrand cut, a second guide RNA must be designed to target the opposite strand. When two crRNAs in close proximity but targeting opposite strands are used, the result is an overhanging doublestrand cut. Because the probability of off-target sites with homology to both of the two target sequences is vastly reduced, this method produces fewer off-target mutational events. When Nickase is used, the target cut sites should be 50-70 base pairs apart, on opposite strands. The two crRNAs should be oriented so that their respective PAM sites are facing towards the outside of the target region. This will ensure double-strand breakage without RNP interference. While the Nickase method offers advantages, it is limited in the availability of two optimally spaced PAM sites at the target locus. Homology directed repair (HDR) results in more finely-tuned alterations. HDR employs exogenous DNA as a template to repair the genome after CRISPR-Cas9-induced cleavage. The introduced DNA includes stretches of homologous sequences, called homology arms, flanking an exogenous sequence containing the desired correction or genetic addition proximal to the targeted doublestrand break. The exogenous sequence will be integrated at the cleavage site, as the introduced DNA is used as a template during the repair process. The crRNA is a critical component of CRISPR-Cas9 genome editing and requires careful design considerations as it will determine the precise cut site of the Cas9 endonuclease. crRNA sequences typically have 20 base pairs of sequence homology with the intended genomic target, located immediately adjacent to a PAM site. 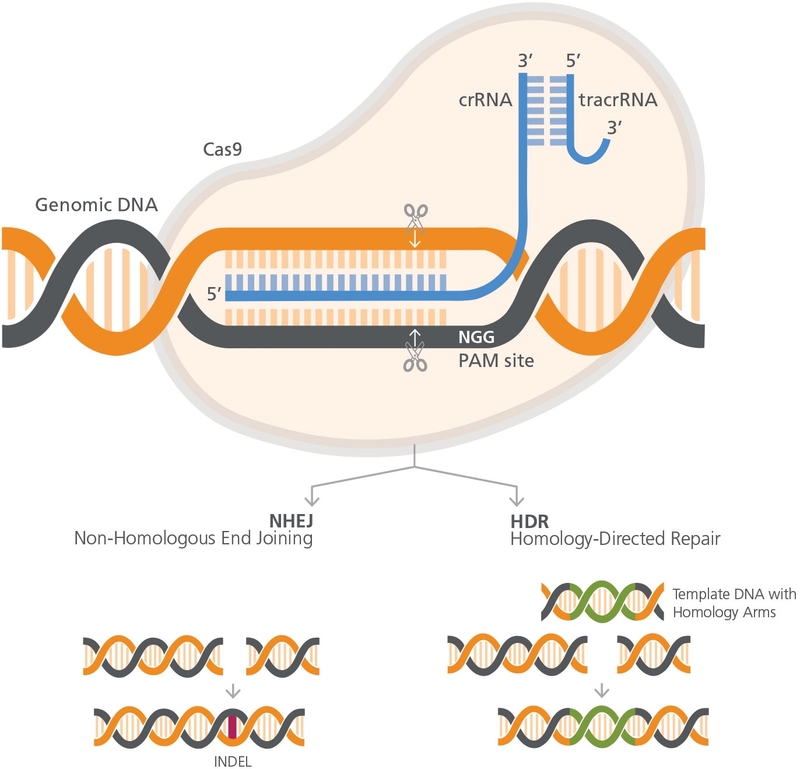 Since the frequency of NGG PAM sites is approximately 5.21% in the human genome6, most genes will have multiple potential crRNA target sequences. Typically, at least three independent crRNAs are tested in parallel to derive distinct edited populations in order to independently verify functional effects of the mutation. This also increases the probability that at least one of the tested crRNAs effectively target Cas9 to the area of interest. Note that the PAM sequence is not included within the crRNA. As mentioned above, the intergenic location of the target site is an important consideration. If the gene contains multiple splice variants, a constitutive exon should be targeted. If the goal is to generate a loss-of-function mutant, targeting the first coding exon is a common strategy. Alternatively, creating larger deletions (>50 base pairs) by utilizing two crRNAs is an efficient way of disrupting gene function. The later method also allows for easier identification of positive transfectants through PCR genotyping across the deletion. If modulation of gene expression is the goal, target promoter elements within 200 base pairs of the transcription start site. A number of online design tools perform comprehensive analysis of any target sequence, providing potential crRNA sequences and sites with potential off-target activity (See Table 1). These tools identify PAM sites within the target sequence and compile a list of recommended crRNA sequences that immediately precede the PAM sites. A genetic map of the crRNA’s intragenic location is typically included. crRNA sequences are scored and ranked based on the number of, and the degree of homology to, potential off-target sites. Select crRNAs from the output list based on location, homology score, and orientation, based on the guidelines described above. CRISPR-Cas9 is versatile and user-friendly compared to previous methods for precise genome editing. The ArciTect™ genome editing system represents a customizable, inexpensive tool for discovery and therapeutic application across all fields of life science research. Jinek M et al. (2012) A programmable dual-RNA-guided DNA endonuclease in adaptive bacterial immunity. Science 337(6096): 816–21. Doudna JA & Charpentier E. (2014) Genome editing. The new frontier of genome engineering with CRISPR-Cas9. Science 346(6213): 1258096. Ran FA et al. (2013) Double nicking by RNA-guided CRISPR Cas9 for enhanced genome editing specificity. Cell 154(6): 1380–9. Chen F et al. (2011) High-frequency genome editing using ssDNA oligonucleotides with zinc-finger nucleases. Nat Methods 8(9): 753–5. Davis L & Maizels N. (2014) Homology-directed repair of DNA nicks via pathways distinct from canonical double-strand break repair. Proc Natl Acad Sci U S A 111(10): E924-32. Sherer S. (2008) A Short Guide to the Human Genome (pp. xiv, 173). Cold Spring Harbor, NY: Cold Spring Harbor Laboratory Press. Haeussler M et al. (2016) Evaluation of off-target and on-target scoring algorithms and integration into the guide RNA selection tool CRISPOR. Genome Biol 17(1): 148. Cradick TJ et al. (2014) COSMID: A Web-based Tool for Identifying and Validating CRISPR/Cas Off-target Sites. Mol Ther Nucleic Acids 3: e214. Heigwer F et al. (2014) E-CRISP: fast CRISPR target site identification. Nat Methods 11(2): 122–3. Hsu PD et al. (2013) DNA targeting specificity of RNA-guided Cas9 nucleases. Nat Biotechnol 31(9): 827–32.